Many people that are over-weight, or just want to lose some weight to get into perfect shape try different diets and watch what they are eating. However, hightecholic today will present you one interesting method, which is actually patented scientific innovation. Stress Free Alarm Clocks are apps for Android and iOS that reduce stress when waking. Why is this important? One of the important reasons you gain weight is because of the high levels of cortisol in your blood. I don't have to tell you that this high levels of cortisol are result of the stress. Waking badly, with loud alarms and in bad timing, raises the stress at the morning and thus it increases the levels of coristol. I wanna tell you that this not only affects your body weight, but also the skeletal muscle mass and overall health. So, how will these apps help you? 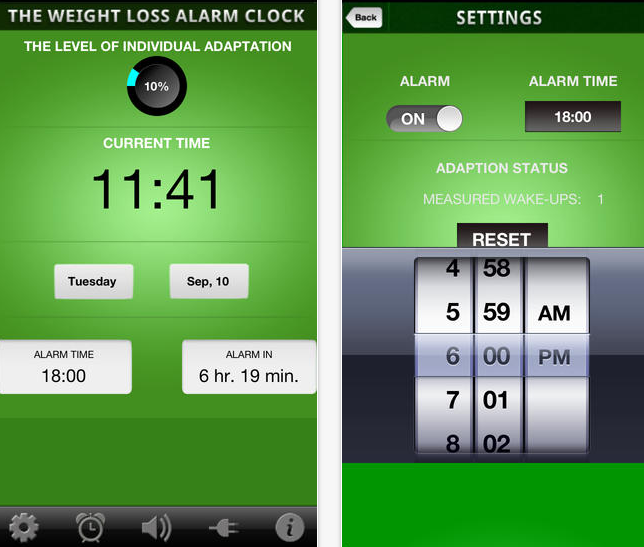 These apps belong to the new generation of sleep cycle alarm clocks that require no sensors. Not only that they will wake you in the perfect time they will use unique alarm sound that will help you to wake easily and with great energy. You will never feel groggy in the morning and you will definitely start the day with reduced stress. Of course this reduced stress will not only deflect on your mood, but also it will bring you a lot of health improvements. The apps are developed by a neuro-scientist. He knew about how stress affects human health and through these apps he just wants to reduce the stress, which will surely lead to loss of weight and improvement in your everyday life.